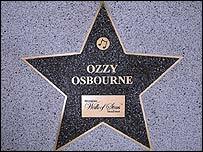 Rock star Ozzy Osbourne has become the first artist to be honoured on Birmingham's own Hollywood-style Walk of Fame. The singer, from Aston, told more than 1,000 fans on Broad Street that the brass paving star meant more to him that than any Hollywood accolade. Other famous people who have ties with Birmingham are to follow to create the new Walk of Stars. He was presented with the honour by the Lord Mayor of Birmingham. "I am really honoured," said the so-called Prince of Darkness. "All my family is here and I thank everyone for this reception - I'm absolutely knocked out." The star is yet to be set in the pavement and the ceremony is on the day of the rock star's concert at the National Indoor Arena. One of the people behind the project, Bill Bohanna, said: "We are really delighted because he feels it's an honour, which is good. "We feel it's an honour and it's representing Birmingham. He's a Birmingham lad and he's done rather well for himself." Organisers have named the 12 most wanted stars for the walk - they include comedians Jasper Carrot, Lenny Henry and Frank Skinner, TV presenter Cat Deeley, pop stars Duran Duran, Jamelia, Robert Plant and UB40, racing driver Nigel Mansell, conductor Sir Simon Rattle and actress Julie Walters. 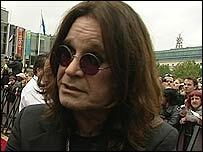 Ozzy said the award was a "shock"